Happy November Readers! I can't believe the month of October has already come and gone so quickly. I'm a little sad because I just love October so much. Halloween is the best part! I hope you all had a great weekend, filled with crazy get-ups and lots of candy to munch on. The bf and I went to a friend's Halloween party on Saturday night and we had a great time. 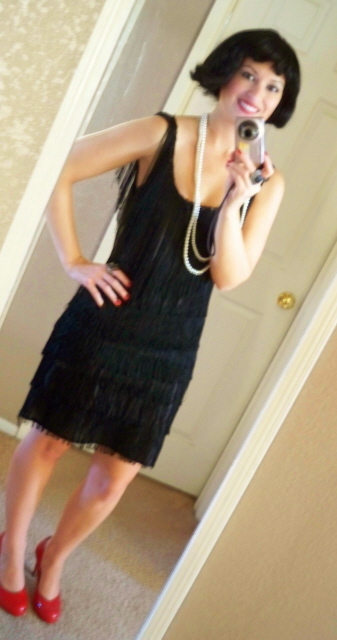 I just wanted to share my 1920's flapper costume. It was sort of last minute but I liked the effect anyway. The 20's are one of my favorite time periods in terms of the fashion. I couldn't stop dancing in my little fringe dress that night, a far departure from my personality! There's just something about it that makes me smile. What did you dress up as? Or did you? I love this!! You look amazing as always! So funny, I was just telling my H I wanted my daughter to be a flapper next year and my son a gangster in a pin stripe suit ;) I love that era! Love this Halloween outfit!! I stayed home with the fiance; we were pretty boring this year. Oh I absolutely LOVE your costume! And I'd wear that dress all the time - not just for Halloween. I actually had a fringe dress from 2-3 yrs ago and I've worn it dancing and had it dry-cleaned so many times, it's quite short and slightly indecent now. Where is your dress from? Now I'm thinking I might want to go get it! Cynthia: There's nothing wrong with staying in. I did too last night! Andi: Oh my gosh, that would be so adorable! I hope they do next year! Amanda: At least you got some quiet time in! Ness: Ooo Aphrodite, how pretty you must have looked! I love all of the Greek Goddesses. Marie: I love it when I hear that other fellow bloggers are petite too! Not sure why, but maybe it's because I am the only shorty out of all of my friends! Natasha: I just saw and commented on your latest post ;) Love it! So adorable. Love that look! You are an adorable flapper girl! I love this. My boyfriend and I went as Mark Ingram(um, he's a little obsessed with Bama football) and a fairy. It was completely last minute but fun nonetheless! Mere, Jessica, and Brittany: Thanks girls! So cute! I love the red heels!